Kim Jon-Un is good at spotting opportunities and seeing the potential in things, and Donald Trump is good at enforcing and maintaining them. Kim is reclusive and impulsive, firing on all cylinders, and Trump’s persuasive and brash. Kim is the eternal optimist, with the ability to transcend mundane realism, and Trump is immersed in hard-core practical matters in the here and now. Together they are an irrefutable force. 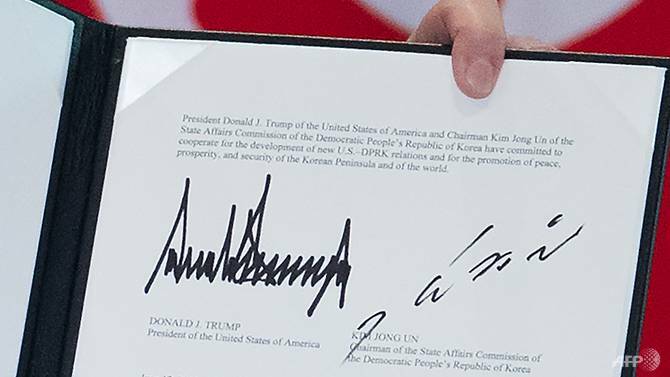 Kim Jong-Un’s signature appears medium-large, dramatically rising, marked right slanting and overly broad with wide spacing between the letters. This means he wants us to believe he’s an unprejudiced and broadminded optimist with an unrestrained enthusiasm for entrepreneurial deals, when in reality he’s Pushy with an indomitable spirit, operating like an impetuous loose cannon, with a desire for plenty of space to function effectively. He enjoys the independence of having personal freedom of action. And, in truth, he’s a reclusive loner who’s potentially out of touch with how other people in society think and feel. Jong-Un puts a brave face on things, so no one really knows how he feels inside. The speed of writing is fast and the style is simplified indicating that he’s got a quick mind that’s good at spotting where opportunities lie, and he’s onto things like a bullet, firing with all cylinders. He likes getting to the root of a problem quickly, and deciding which issues are relevant and which aren’t…. to arrive at a practical solution in a heartbeat. He wants to achieve something audacious and long lasting that will be seen as valuable for society and ensure his place in the history books. Donald Trumps huge angular signature with tall spiky peaks transmits wild ambition and fearlessness. He’s an iconoclast, maverick risk-taker and firmly believes the world revolves around him. Trump is the consummate entrepreneur with a steely hard aggressive core. The upright slant depicts his glacial, poised surface (and hides his fiery depths)! The varying size of the tips of the tall stems means that ideas may pinball around in his head, but ultimately he excels at being hard lined and pressing his policies home (overconnected or joined up letters). He’s a bold, tough, direct negotiator, and orchestrates through immense self-discipline and commitment (seen in the rigid regularity of the writing, particularly the small letters sitting on the baseline). The crowded layout indicates someone who doesn’t listen or consider anyone else, because he thinks he knows best. The flooding of letters reveals his explosive temper, if he doesn’t get his own way. Trump is undaunted by any previous failures as he carves a path and forges ahead in the world. Failure is simply not an option. Both men are equally hungry for power, determined and committed to break down glass walls by whatever method works. Their union symbolises Entrepreneurialism meeting Politics. Trump is self-disciplined which means his “unwavering commitment” is firmly applied to his transactions, whereas Kim is an impetuous knee-jerk reaction who does things spontaneously on the spur of the moment, almost on a whim, without necessarily thinking through the consequences of his actions. The flyaway horizontal stroke with blunt ending highlights his strong will. The blunt endstrokes, both on the horizontal and the vertical, combined with the open oval and broken letter reveal that he has a foul temper and could lose it in a blink!